Limited Edition Single Rail Ride On Trailer for Motorcycles – Fits Cruiser style bikes, incl. Harley Davidson, Yamaha Star, Goldwing, Sport Bikes and more. Kendon's New Single Ride-Up SRL Trailer Retrofit Kit offers a simple upgrade to the latest Single Ride-Up SRL technology. The Single Ride-Up SRL trailer expands on the standard single rail motorcycle trailer offering an easy loading solution for everything from lightweight sport bikes to heavyweight touring bikes. The Single Ride-Up SRL combines ride-up convenience with a lightweight, user-friendly design. The Single Ride-Up SRL retrofit kit conversion incorporates Kendon's new SRL technology without having to change major axle parts or purchasing a whole new trailer. What exactly is SRL? SRL is short for "Suspension Reactive Loading." SRL eliminates the apex created by a traditional ramp angle and the bed of the trailer when loading and unloading. The independent torsion suspension on the ride up trailer works with the loading ramp to eliminate the apex and creates a smooth parallel surface for loading and unloading a bike. 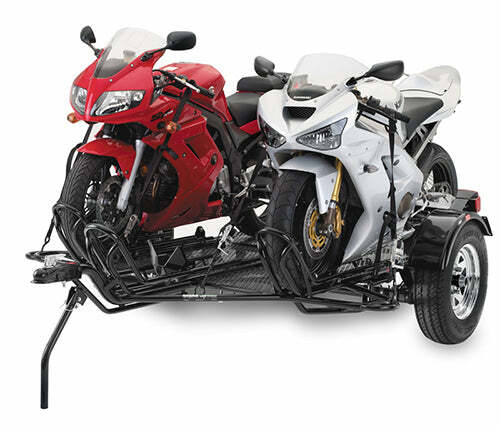 The suspension compresses and lowers the bed of the motorcycle trailer while loading a motorcycle and raises it back up to towing height after the bike is fully loaded onto the trailer. The Single Ride-up SRL retrofit conversion kit is available for 2003 and newer Kendon Single Rail Trailers for Motorcycles and Kendon Single Chopper Trailers (US Models only, excludes Canada models). The retrofit kit is NOT compatible with utility boxes installed on the trailer (ramps cannot be stored for transport if utility boxes are installed). The conversion kit is a bolt-on component with minor drilling required for relocation of the rubber latch. Key Ride-Up Trailer Conversion Kit features and benefits. Single Rail Ride-On Motorcycle Trailer for Cruisers, incl. Goldwing and Harley, Sport Bikes and more. The Kendon Single-Rail Folding Stand-Up™ Motorcycle Trailer is our premiere single bike trailer and incorporates the best we have to offer. The Single-Rail SRL may seem small, but it packs a powerful punch of lightweight, user-friendly design and amazing, space-saving convenience. The Single Ride-Up trailer offers ride-on capabilities, Kendon’s renowned towing performance and load carrying capacity of one full-size motorcycle up to 1,000 pounds. When in storage, the one-rail ride-on bike trailer takes up about the same space as a small bedroom dresser or a chest of drawers. Thanks to our Suspension Reactive Loading (SRL) frame geometry and suspension design you can ride your bike onto the single trailer, making it much easier to load heavy, full-size bikes. As you ride your bike onto the trailer the suspension compresses under the weight of the bike, virtually eliminating the ramp-to-trailer apex. Once the bike is loaded, the suspension rebounds back up and levels the trailer. Our Ride-Up models feature wider loading ramps, wider rear sections, and foot extensions to provide safe foot placement as you ride the bike onto or back the bike off of the trailer. Lightweight design for true one-person operation (a spotter is always recommended for safe trailer usage). 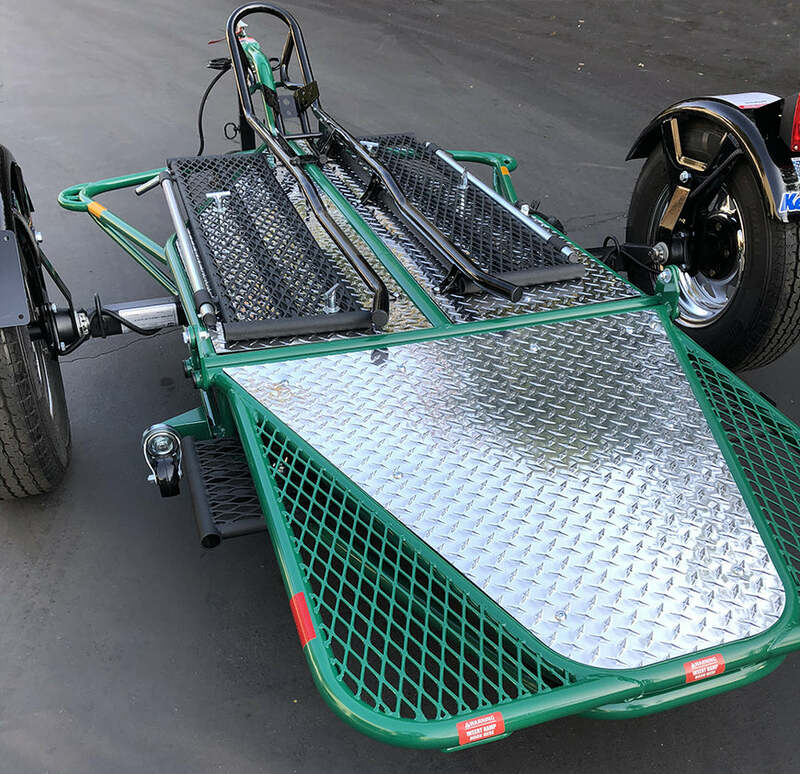 The Single-Rail trailer features a wide expanded metal with diamond plate deck area designed to hold one full-size bike such as a Harley-Davidson, GoldWing, K1600, adventure bike, etc. The heavy-duty torsion-bar axle and hub combination give the Single-Rail its full 1,000-lbs. carrying capacity. The Single-Rail SRL Ride-Up Folding Stand-Up™ Motorcycle Trailer is perfect for any rider – from moto to track, cruiser to sport. It combines ride-on convenience and safety with a lightweight, user-friendly, space-saving design. Designed for bikes of all sizes and riders of all styles, this is the trailer for you no matter what or where you ride. 13-inch alloy wheels with radial tires; choose from four rim styles! Add accessories to your trailer for a complete towing package. From tie-downs to LED Lights to full Deluxe Trailer Accessory Packages. A range of accessory options is available to enhance the functionality of your Kendon trailer. Also available is a full line of replacement parts. Should something go wrong, Kendon has you covered. Single Rail Trailer for Cruisers, incl. Harley Davidson, Goldwing, Sport Bikes and more. For one bike, lightweight, space-saving convenience the Kendon Single-Rail Folding Stand-Up™ Motorcycle Trailer is perfect for you. Outstanding towing performance and excellent value make this single-rail trailer a must-have. 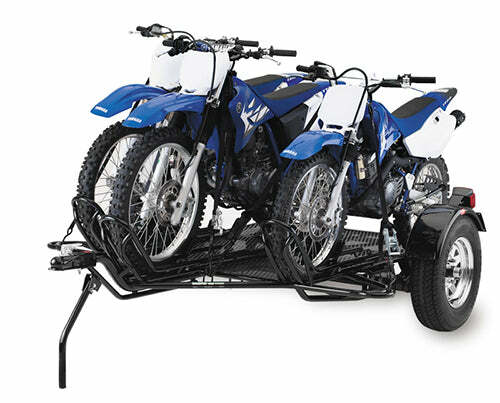 The Single-Rail trailer carries one full-size motorcycle or, with the rail removed, can haul various types of cargo up to 1,000 lbs. At only 300 lbs., the Single-Rail trailer is easy to maneuver and takes up about the same space as a small bedroom dresser or chest of drawers. Superior design, exceptional performanceExceptional performance doesn’t just happen by accident, it’s a product of superior design and years of testing and refinement. Kendon’s round steel tube construction and triangulated frame geometry is inspired by race car design and engineering. The result is a trailer that is incredibly easy to use and even easier to tow. Lightweight versatilityOur years of testing and refining our frame geometry helped us develop an amazingly lightweight, incredibly strong trailer. That means a great ride for your bike and an easy tow for your vehicle. And for you that means a trailer that’s easy to stand up and maneuver in the garage. Flying soloThe Single-Rail trailer features a wide expanded metal and diamond plate deck area designed to hold one full-size bike such as a Harley-Davidson, GoldWing, K1600, adventure bike, etc. The heavy-duty torsion-bar axle and hub combination give the Single-Rail its 1,000-lbs. carrying capacity. The Single-Rail Folding Stand-Up™ Motorcycle Trailer is perfect for any rider – from moto to track, cruiser to sport. It combines lightweight, user-friendly, space-saving design with full-size-bike trailering capabilities. 13-inch aluminum wheels with radial tires; your choice of rim style! Add accessories to your trailer for a complete towing package. From tie-downs to LED Lights to spare tires to full Deluxe Trailer Accessory Packages. A range of accessory options is available to enhance the functionality of your Kendon trailer. Also available is a full line of replacement parts. Should something go wrong, Kendon has you covered. Big and beefy and ready for action, the Folding Stand-Up™ Smart Car Trailer works perfectly to carry your Smart ForTwo Car. With its large 6 ft. x 9 ft. expanded metal deck and customized tie-down anchors, the UT305SC trailer is your best choice. And in true Kendon style, it folds up and stands up for amazing space-saving convenience. The Smart Car Trailer has a 2,000-lbs.-rated axle and heavy-duty expanded metal deck. Big, strong, and useful. This trailer folds up and stands up and has a footprint barely larger than a large bedroom dresser. Convenient, manageable, and helpful. Exceptional performance doesn’t just happen by accident, it’s a product of superior design and years of testing and refinement. Kendon’s round steel tube construction and triangulated frame geometry is inspired by racecar design and engineering. The result is a trailer that is incredibly easy to use and even easier to tow. 3.) 5-Spoke Aluminum Wheel with Radial Tire upgrade is available for all Kendon trailers. 4.) Hitch Height refers to the standard hitch height, which may vary with vehicle, trailer, and load. Trailer should be level in tow. Check carefully before towing. 5.) UT305SC Trailer features a removable tongue for storage. Standing height is 96″ with tongue removed. Standing height is 103″ with tongue installed. 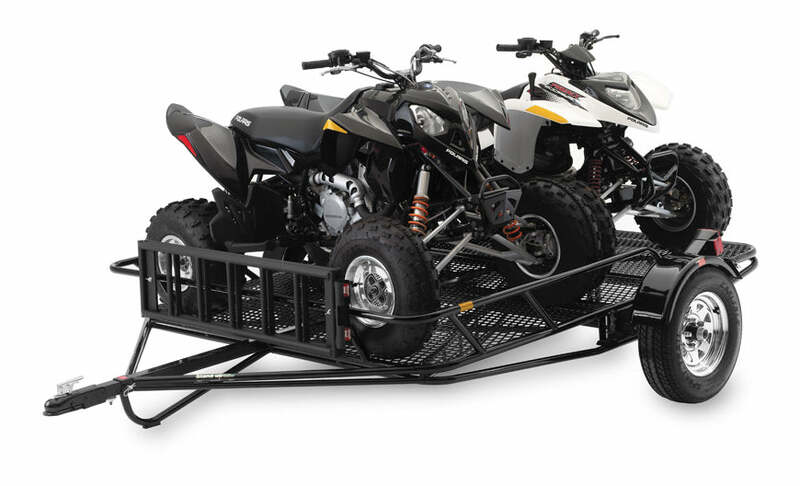 3-Rail Folding Combo Off Road Trailer and Dual Sport Trailer for Dirt Bikes and Adventure Touring Applications. Versatility reigns supreme with the Kendon Three-Rail Stand-Up™ Trailer. One trailer to haul your dirt bikes, your sport bikes, adventure bikes, and scooters. The three-rail dirt bike trailer will even work for one heavy American v-twin or metric cruiser. If you’re into bikes of all shapes and sizes, the Three-Rail may be just what you’re looking for. With its large expanded metal deck, three bike rails with adjustable wheel chocks, and 1,500-lbs. capacity, the Three-Rail Stand-Up™ trailer has the might and attitude you need. With its convenient fold-up, stand-up design and 27 in. x 84 in. storage space requirements, the Three-Rail Stand-Up™ Trailer has the features you want. Exceptional performance doesn’t just happen by accident, it’s a product of superior design and years of testing and refinement. Kendon’s round steel tube construction and triangulated frame geometry is inspired by racecar design and engineering. The result is a trailer that is incredibly easy to use and even easier to tow. Our years of testing and refining our frame geometry helped us develop an amazingly lightweight, incredibly strong trailer. That means a great ride for your bike and an easy tow for your vehicle. And for you that means a trailer that’s easy to stand up and maneuver in the garage. The Three-Rail trailer loves company. So go ahead, load three dirt bikes, sport bikes, scooters, adventure bikes, or lightweight standard bikes and hit the road. You can even load two heavier bikes or a combination of bikes as long as you have the space and you stay below the 1,500-lbs. capacity limit. Take the family. Take some friends. Go. Ride. Whether your heading to the track to spin laps, heading to the hills for some single track, or heading out of town for a new destination, the Three-Rail Folding Stand-Up Motorcycle Trailer is perfect for almost any adventure. And when that adventure ends, stand your Kendon trailer up, roll it away in the garage, and wait for next weekend’s fun. 13-inch alloy wheels with radial tires; select from four different styles! Add accessories to your combo trailer for a complete towing package. From tie-downs to spare tires to swivel jack stands. A range of accessory options is available to enhance the functionality of your Kendon trailer. Also available is a full line of replacement parts. Should something go wrong, Kendon has you covered. Folding Stand-Up™ Bike Lift for American V-Twin and metric cruisers, including Harley-Davidson and Goldwing applications. Don’t sleep on Kendon’s folding stand-up™ motorcycle lifts! The most versatile product in the Kendon line-up. P.S. Want to skip to what’s new for the 2019 motorcycle lift model? Skip by Clicking Here! This Motorcycle Lift is designed to fold up and stand up out of your way when not in use. Yet, it’s capable of lifting 1,000 lbs. just like the bigger and heavier non-folding lifts. Our bike lifts perform all the same tasks a professional motorcycle lift can do, but they take up a minimal amount of space in your garage so you have more room for bikes, cars and other equipment. The footprint of a Kendon bike lift is only 17 in. x 26 in. so you can always find a spot to store it when you’re not wrenching or cleaning. The lift is roughly the same width as a push broom and will fit right through any standard door without the need to turn it when it’s rolled on the integrated casters. But why would you want to get it through a door? Well, at only 185 lbs. 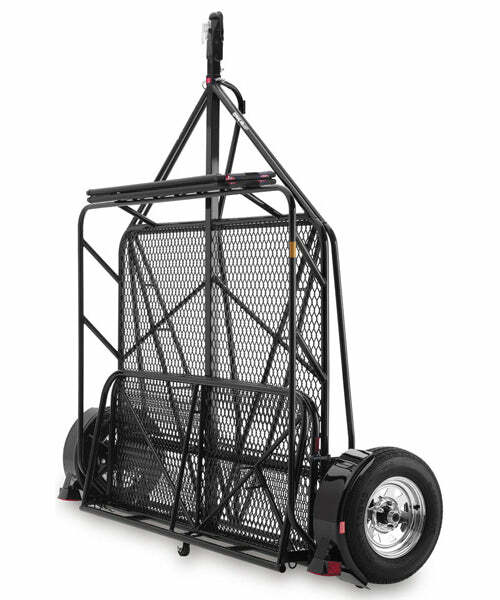 you can easily roll it on it’s casters, throw it in back of your car, truck or SUV and take it to the track, to your buddy’s house, or wherever you need it whenever you need it. And you can actually use it whenever, wherever! The air-over-hydraulic operation lets you actuate the lift using the hand pump or an air compressor. So come on, give your back a break and stop working on the ground. Get yourself a Kendon folding motorcycle lift. The Cruiser Bike Lift is perfect for American V-Twin and metric cruiser motorcycles and heavyweight street bikes, including Harley-Davidson, Indian and Goldwing models. With a 1,000-pound capacity this folding motorcycle lift can accommodate almost any bike on the road today. These bike lifts can fit a bike up to 95″ long (measured from the front of the front wheel to the center of back wheel) and have the lifting power to get the job done. We know you like to get close and personal with your bikes, get them running and looking good. We get it, we do too, so our motorcycle lifts feature narrow-rail construction so you can get up close to your bike to perform any maintenance work and/or cleaning without having to worry about the lift and bike tipping over as soon as you touch anything. Kendon’s Bike Lifts have a large footprint similar to industrial size motorcycle lifts that provides a stable working environment. No need to worry about bumping into the lift and having it tip over with your bike on top. If you’re looking to simply clean your bike, perform routine maintenance, undertake a complete overhaul, or display your motorcycle at a bike show, our folding motorcycle lifts are the perfect solution. And when you’re done, it stores nicely tucked away in the corner. We’ve changed and added a few features on the 2019 Kendon folding motorcycle lifts to make them even more versatile and easier to use. Wider platform, redesigned wheel chock, automatic height lock, improved air/hydraulic cylinder and more. We also increased the overall stability and rigidity so that you can safely and confidently use the lift with practically any model bike. We redesigned the safety bar and height lock so that it automatically engages as the lift is actuated, so you don’t have to worry about something going wrong and your bike crashing down. We also increased the platform width to 10.5 inches giving you more room to work with while still allowing to get up close to the bike. We made some tricky changes to the air and hydraulic cylinder so you will now have more control over a controlled descent. This means that controlling the descent is much easier so you can lower your bike as quickly or as s-l-o-w-l-y as you want. The motorcycle wheel chock has been completely redesigned with convenience and usage in mind. 6 different wheel chock positions so you can have wheels small and large. Lower wheel chock pivot point so those heavy bikes aren’t a chore to back out. Plus, removable and folding front wheel loop so you can remove it to easily drop your front wheel or fold it when the lift is standing to further reduce the depth of the lift below 17 inches. We also made the entire wheel chock system completely removable. Simply unbolt the wheel chock and rails and you have a flat table lift. Note: The wheel chock and front wheel loop are powder coated all black. Few more minor changes and additions include lower profile hinge points on the folding rear section, safety bar insert to securely disengage the safety bar, adjusted ball joints for improved manual pump actuation, longer release knob, adjusted air hose retention clips to avoid potential crushing, and you can now safely stow the ramp on the lift. Kendon’s bike lifts feature an air-over-hydraulic jack with extruded aluminum housing for improved valving and slow, controlled descent. The lift can be used manually with the included hand lever or using a compressor. A multi-position adjustable folding wheel chock along with a five-position height lock keep your bike securely in place. The folding chock system and folding rear section are completely removable for a flat working surface and make dropping the front and rear wheels a breeze. 2.) Maximum Length refers to the unfolded/open trailer length measured from the front of the front loop to the back of the rear folding section.